Each week, churches collect an offering; it is a practical expression of one’s personal faith to support the work of the church, as well as supporting local and global community initiatives and projects. In the community, more than 80% of adult Australians contribute to charities and non-profit organisations. The statistics from 2015-16 show that $12.5 billion was given (up from 4.7 billion a decade ago). The average donation of $764.08 was up too in real terms, by $210.16. Interestingly, the percentage of people donating dipped from 87% to 80% over the same period. The decreasing giving participation rate is a concerning trend that needs to be monitored. Annual data on tax-deductible donations tells a similar story, underlining the concern about a flatlining future for Australian charities if fewer people donate. Some Australians are doubly generous, giving their time and their dollars. Those who both gave and volunteered donated nearly twice as much on average as givers who did not volunteer ($1,017.11 compared to $536.69). An estimated 43.7% of Australians volunteered an average of 2.5 hours a week, and a median of 55 hours over the year. This was up from 44 hours in 2005. (We are very grateful for the many people at Pilgrim who volunteer their time so generously). More than 60% of charitable donations are given on the spur of the moment. Others consider, plan and deliberate about their giving. Some sign up to give in a sustained way month by month. Others might sit with their children and plan what donations they will make as a family in the year ahead. On average, these “planner donors” donate six times as much in a year as the impulse donor. Nearly three-quarters of donations are focused on social services, education and research, health, culture and recreation, and development and housing. Practical support for the welfare of others, and a contribution to human flourishing – rather than allowing disadvantage to be the defining force in a person’s life. The impact of giving is immense in more than dollar terms, both for the recipient and for the giver. Fair enough. 13% is quite a lot… So if it were left up them, what did most people think was a reasonable percentage to spend on foreign aid? On average? 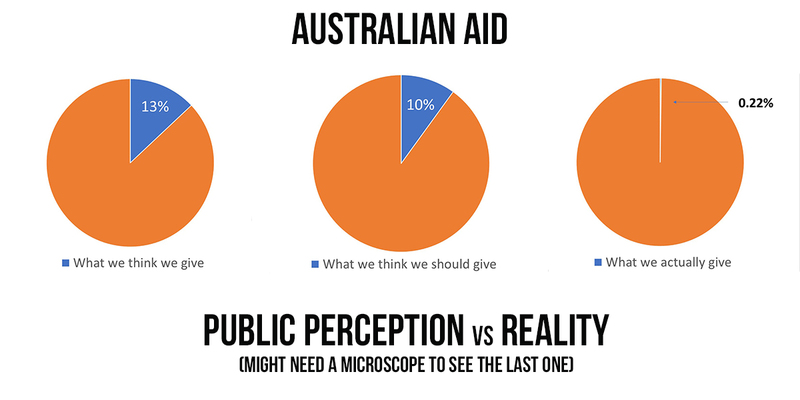 Most people thought around 10% of the Australian budget would be fair to spend on foreign aid. As a nation we give only 22 cents in every hundred dollars to life-saving vaccines, providing clean water and vital medical assistance. Yet even such a tiny amount is helping make some stunning progress toward overcoming poverty. Donate your own money to projects that are supported by the Australian Government’s aid program. This lets the Australian Government know you support well-administered, accountable aid. Right now, the Australian Government wants to know what you think of UnitingWorld, a Uniting Church agency. They’re prepared to support UnitingWorld with significant funding, but they want to know you’ll back UnitingWorld with your own money first. For every $5 they make available to UnitingWorld through Australian Aid Funding, UnitingWorld needs to match the support with a donation of at least $1. This is a big opportunity to show the Australian Government you care about Australian Aid funding and want to see it increased, and will allow UnitingWorld to make each donation go up to six times as far this end of financial year. Time to take the pulse on generosity to see how we’re doing! This prayer by Jon Humphries is adapted from the UCA ‘Statement to the Nation’ presented at the time of union in 1977. The Statement still resonates deeply in our contemporary context – in local and global matters, and as the church works through its own prioritites and fundamental commitment to hope and work for a nation whose goals are not guided by self-interest alone, but by concern for the welfare of all persons everywhere. As followers of Christ, our faith calls us to love our neighbour and welcome the stranger. We have particular responsibility to challenge unjust systems and speak on behalf of those who are marginalised and in exile. Right now, it is harder than ever for refugees and people seeking asylum to find a safe place to live and to rebuild their lives. Australia’s policies are making it tougher for families living in detention or in the community to gain their right to protection. I am thankful to many in the Uniting Church who are already doing so much to support refugees, through practical and pastoral care, prayer and advocacy. In Refugee Week (17-23 June), I encourage Uniting Church members to think about how they can tell those in Government that we can do better for refugees. In the lead up to the next election, all major parties will be re-assessing their policy position on this issue. Visit your local MP and share your desire for a more compassionate and humane response to refugees and people seeking asylum. The more people in our community who speak up on this issue, the more likely we are to create a real opportunity for change. When we advocate for others in this way, we give life to our faith in Jesus. When advocacy and service are done with integrity, and as a proclamation of the Gospel, the Church bears witness to Christ, and enters fully into the faith and mission of the whole Christian church. Together, as members of the body of Christ, may we seek a just society that upholds the dignity of every person where all can have hope for a decent peace-filled life for themselves and their families. The film ‘Border Politics’ has been launched in Melbourne as part of Refugee Week and screenings will take place in other cities in July (a Q&A screening on July 4th at Mitcham cinemas in Adelaide) and may be of interest to those who would like to explore more deeply the politics around border control and the treatment of refugees and asylum seekers. The film follows human rights barrister Julian Burnside as he traverses the globe examining the harsh treatment meted out to refugees by most Western democracies. Burnside defines humanity with the universally recognized Golden Rule – Do Unto Others As You Would Have Them Do Unto You as a benchmark. He questions whether the West has lost its moral compass by adopting ideas that reject humanity and undermine democracy. He concludes this erosion of human rights poses a threat to the very democratic values that define Western society. On my travels in Ireland I’ve been fascinated to learn about symbols of the cross in Ireland. The St Kevin cross from Glendalough is an example of how St Patrick tried to help the once pagan people of Ireland acclimatise to Christianity. This was done by combining the cross with the circle representing the sun, because the pagans worshipped the sun and moon. 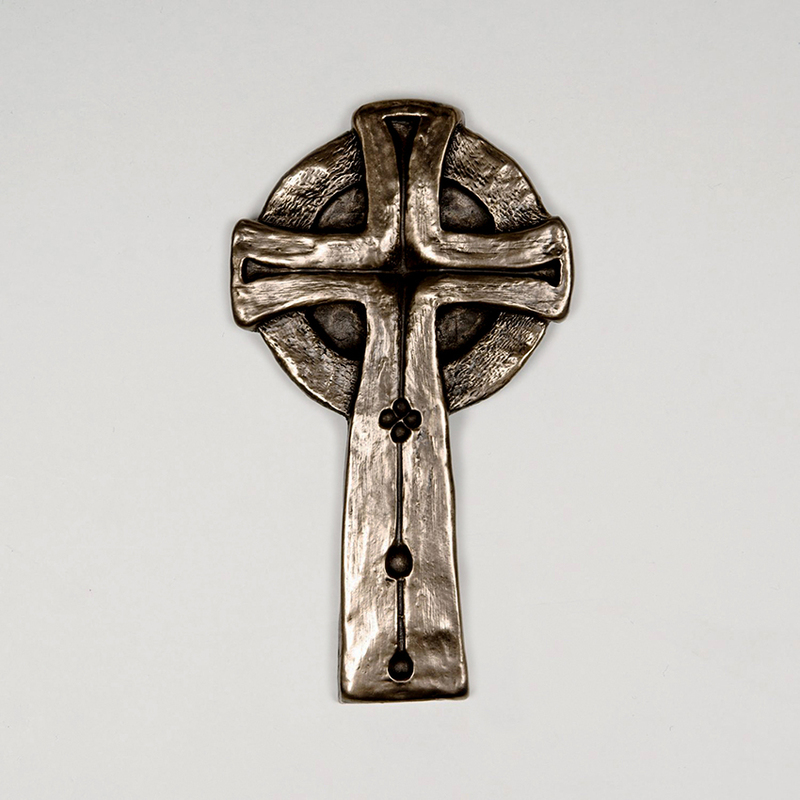 In time, this particular Celtic Cross was recognised as a Christian symbol. St.Brigid was the founder of the first Irish monastery in County Kildare, Ireland. She is credited with creating the unique cross which bears her name. The tale of its creation is somewhat confused, and there is not one definitive version. The tale as we know it is as follows….There was an old pagan Chieftain who lay delirious on his deathbed in Kildare (some believe this was her father) and his servants summoned Brigid to his beside in the hope that the saintly woman may calm his restless spirit. Brigid is said to have sat by his bed, consoling and calming him and it is here that she picked up the rushes from the floor and began weaving them into the distinctive cross pattern. Whilst she weaved, she explained the meaning of the cross to the sick Chieftain and it is thought her calming words brought peace to his soul. He was so enamoured by her words that the old Chieftain requested he be baptized as a Christian just before his passing. 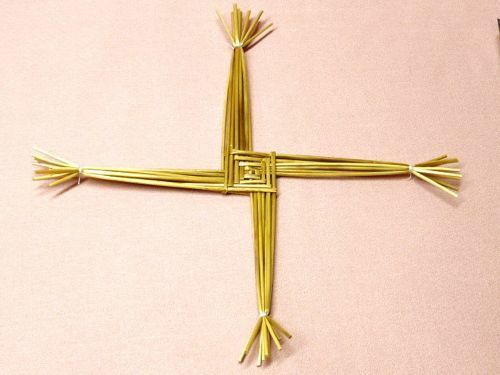 Since that day, and for the centuries that followed, it has been customary on the eve of her Feast Day (1st February) for the Irish people to fashion a St. Brigid’s Cross of straw or rushes and place it inside the house over the door to keep evil, fire and hunger from the homes in which it is displayed. A few years ago, Pat Baker gave me a necklace with a cross, and on it was a female figure. 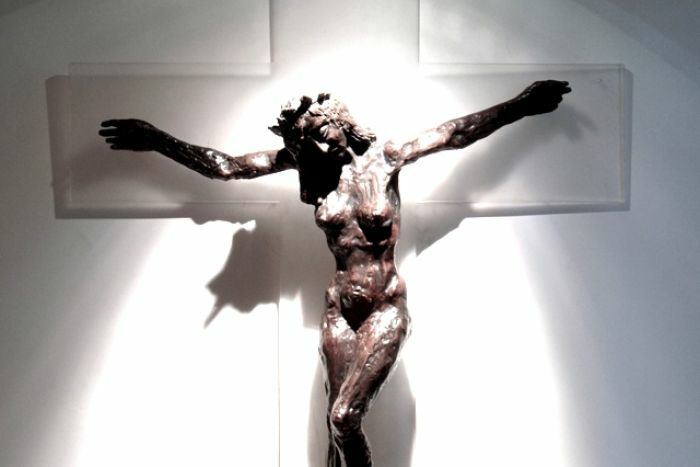 The female image on the cross was thought of as nothing less than blasphemy when British sculptor Edwina Sandys wrought Christa in 1975. For the artist, it was a recognition that women had suffered and sacrificed their lives for love. Women were among the original martyrs of Christianity, brutally crucified by the Roman Empire. And then there’s the inverted neon red crosses – four of them, each 20 m tall, that have been erected in Hobart as part of the mid-winter festival known as Dark Mofo. Mofo’s creative director, Leigh Carmichael, said provocation was part of Mona’s* DNA and argued that while “the cross is deeply significant in our historical context … symbols don’t have an inherent meaning. The meaning comes from what we bring to them”. He said, “Dark Mofo has been exploring ancient mythology and religious themes since its inception in 2013. The cross is a powerful and deeply significant historical symbol, that has been used for thousands of years, with many cross-cultural meanings”. Inevitably, predictably, there has been reaction. Outrage is the DNA of social media, and statements like Yvonne McAskill’s resonate with many: “All Christians are shuddering at this diabolical sign”. Clearly there is a lot of support for that point of view. Interestingly, the original meaning of an upside-down cross was to recall the crucifixion of St Peter, one of Jesus’ disciples. When he was crucified by the Roman Empire at a time when Christians were persecuted, he insisted he be crucified upside-down, because he felt he wasn’t good enough to be crucified the way that Jesus was. So at one point it was a sign of penitence, long before it was adopted as an ‘anti-Christian’ symbol. Michael Frost writes: The latest outrage-du-jour for Australian Christians is the upside crosses installation in Hobart. For a start, since when do Christians get offended by ART?!?!? We’re followers of the King who converted humiliation into grace. Art is meant to be a provocation, a discussion starter. So let’s have a conversation. Secondly, why all the knee-jerk outrage these days?!?!? 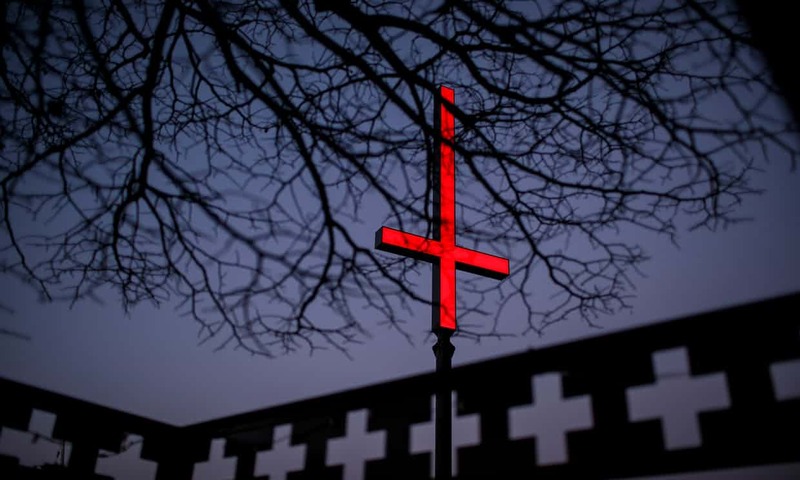 Reverend Matt Garvin of the Citywide Baptist Church, said that while the inverted cross was “commonly thought to be a Satanic symbol”, churches should “engage with the conversation that has been created (in Hobart)”. How might churches and individuals engage with conversation in the public square rather than being (stereotypically) reactive? On May 6th, Ben Clarke from TEAR SA spoke about his recent trip to Cambodia looking at community based projects. Many in Pilgrim have a strong commitment to supporting the work of UCA partner churches. Earlier this year, a donation was made to the UnitingWorld appeal for Tonga after it was devastated by Cyclone Gita on February 12th. Pilgrim also offers support for the United Church of Christ in the Philippines through active participation in the Philippines Support Group, and community projects in the Philippines. In an article on his website, Mike Frost poses a question for our day: Should we be helping other Christians before we help non-Christians in greater need? Mike writes: This question came into even sharper focus recently when the Trump administration announced that its nominee to become director general of the United Nations’ International Organization for Migration (IOM) was Ken Isaacs. The IOM has an annual budget of over $1 billion and is tasked with providing secure, reliable, flexible and cost-effective services for those needing international migration assistance. Refugees, basically. So alarm bells started sounding for some when it was revealed that Ken Isaacs, currently the head of international relief for Franklin Graham’s Samaritan’s Purse, has made comments that in some cases Christians should receive preferential treatment when being resettled from hostile areas. These comments appear to have been made on social media, reflecting on the persecution of Christians in the Middle East, and were coupled with disparaging references to Islam as a violent religion. Mr Isaacs has since apologized for these remarks and said, “I pledge to hold myself to the highest standards of humanity, human dignity and equality if chosen to lead IOM.” Certainly, he has demonstrated a committed to helping refugees and has a long history of assisting those who are suffering. But his remarks, though retracted, reveal an underlying belief within the Christian community that we should help Christians before helping people of another religious faith (or no faith). I fear it is becoming an entrenched assumption by many Christians that “charity begins at home”. There are many in Australia who express similar sentiments. Didn’t Paul say we should prioritize doing good to Christians? It’s the use of especially they seize on. They agree we should help others, but insist that Paul is saying that we should prioritize assisting other Christians. That makes sense, I guess, if you look at this verse in isolation (which lots of people apparently do). But if you read it in its broader context, the meaning is somewhat different. In the preceding section, Paul had just warned his readers to avoid sin, or to use his phrase, “sowing to please their flesh” (v.8). Instead, he insists, we should “sow to please the Spirit” and “not become weary in doing good” (v.8-9). So, doing good in this context refers to avoiding sin and pursuing spiritual things. When Paul concludes his argument by saying we should “do good to all people,” he means we should be helping everyone avoid sin and pursue the Spirit. So, it makes perfect sense that he would say “especially those who belong to the family of believers” because it’s particularly applicable to other spiritual people like the church members in Galatia. This passage isn’t about providing practical assistance at all. Another Pauline passage often cited in this context is 1 Timothy 5:8, “Anyone who does not provide for their relatives, and especially for their own household, has denied the faith and is worse than an unbeliever.” This verse is in the context of Paul’s discussion about the need for church families to care for the widows in their midst, and is most certainly referring to practical assistance. At that time, widows were extremely vulnerable members of society, particularly those without children or extended family to care for them. Paul insists that the church as a whole care for those widows with no family support, but that individual families had responsibility to “provide for their relatives” and not expect the rest of the church to carry them. It’s very practical advice, but it can’t be used to defend the idea we should only take care of fellow Christians. Jesus said, we should care for his followers first, right? Another passage that could be used to make the case that we should show favouritism to Christians when helping the needy is Jesus’ Parable of the Sheep and Goats (Mt. 25:31-46). In that story people are separated into two groups – those who did feed, clothe, house and comfort “the least of these brothers and sisters of mine” and those who didn’t. The latter are sent away to eternal punishment, while the former receive eternal life. For a long time, “the least of these” was assumed to refer to the poor in general. But this was a problematic interpretation. Was Jesus saying that our eternal salvation is earned by feeding and clothing the poor? Surely this contradicts the biblical teaching on salvation by grace alone (Eph. 2:8-9). More recent interpretations have concluded that “the least of these brothers and sisters of mine” just refers to Christians in need – those spiritual brothers and sisters of Jesus. They would be in need of food and clothing and housing, and especially being attended to in prison, if they were persecuted Christians, possibly evangelists and teachers. Those who refuse to help supply their material needs are presumably also those who reject their message. If “the least of these” are Jesus’ messengers, then it makes sense for Jesus to say your salvation is based on your response to their message – that is, the Gospel. In other words, even if the Parable of the Sheep and Goats does refer to helping Christians, it isn’t making a case for prioritizing them over others in need. It’s a comment on the acceptance or rejection of the Gospel. Are Christian refugees in greater need than others? Whether Ken Isaacs cites Galatians 6 or Matthew 25 I don’t know. His work in Syria and other parts of the Middle East has, no doubt, has put him face to face with the terrible persecution being meted out to the church there, and his comments about prioritizing Christians might reflect this. What is more difficult to understand is the attitude of the US President, Donald Trump, and the Australian Prime Minister, Malcolm Turnbull, neither of whom present as devout Christian men. Both Mr Trump and Mr Turnbull have publicly stated they will prioritize Christian refugees over others. It’s very hard to get away from the view that it is a form of state-supported prejudice against Muslims. Mr Trump’s proposed travel ban against certain Muslim-majority countries reinforces this. As concerning as it is for secular states to engage in this kind of prejudice, my other worry is that Christians are being infected by this prejudice, believing it actually honors God for us to show favoritism toward other Christians. A far more helpful passage of Scripture to consider in this discussion is another of Jesus’ parables, the Good Samaritan (Luke 10:25-37). The story is well known. A man is set upon by thieves, beaten to within an inch of his life, and left dying by the side of the road. Two fellow Jews – one a priest, the other a Levite – ignore the man, while a Samaritan – despised by the Jews – not only lends some assistance, but does so at great personal cost. The moral of the story: be like the good Samaritan. Jesus told this parable in response to a man asking whether it was true that the Law of Moses required you to love your neighbor as yourself. When Jesus agreed, the guy, looking for a loophole, asked, “And who is my neighbor?” Jesus’ answer-in-the-form-of-a-parable is, quite simply, anyone you encounter who is in need. It’s interesting that Ken Isaacs, the man currently in hot water about his nomination to the International Organization for Migration, currently works for Samaritan’s Purse. In Jesus’ story, the Samaritan’s purse was open to whomever was in need, not only his fellow Samaritans. As Christians we need to go back to the question of who is our neighbor, and also ask, what does it say about us if we’re only interested in saving our own kind? Of course, we should want to help our sisters and brothers in Christ. But we also have a moral obligation to reject a policy that sees a secular state selecting refugees based on their religious beliefs. Today it’s Muslims who suffer from this favouritism, but a time might come when it’s Christians who are prejudiced against, and who could blame them if we looked around on that day and found our Muslim neighbors unwilling to help us.